The demands for producing with higher product qualities in shorter drying times for temperature sensitive products can be met by using microwave heat treatment in combination with vacuum drying. Microwave drying has a big advantage compared with conventional drying, because in microwave drying, heat is generated by directly transforming the electromagnetic energy into kinetic molecular energy; thus the heat is generated deep within the material to be dried. Especially in microwave vacuum drying this advantage has a big significance for viscous and bulk products with poor thermal conductivity. 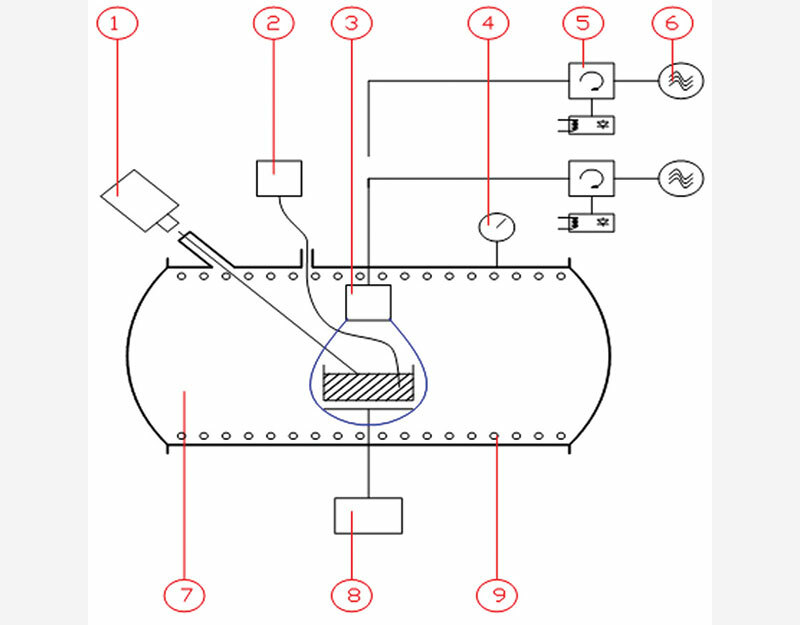 By using appropriate process control even applications with explosive protection can be managed. Within a continuous production line, the group of continuous working microwave vacuum plants can be incorporated when processing granular, powders as well as bulk materials and solid products on tool carriers. 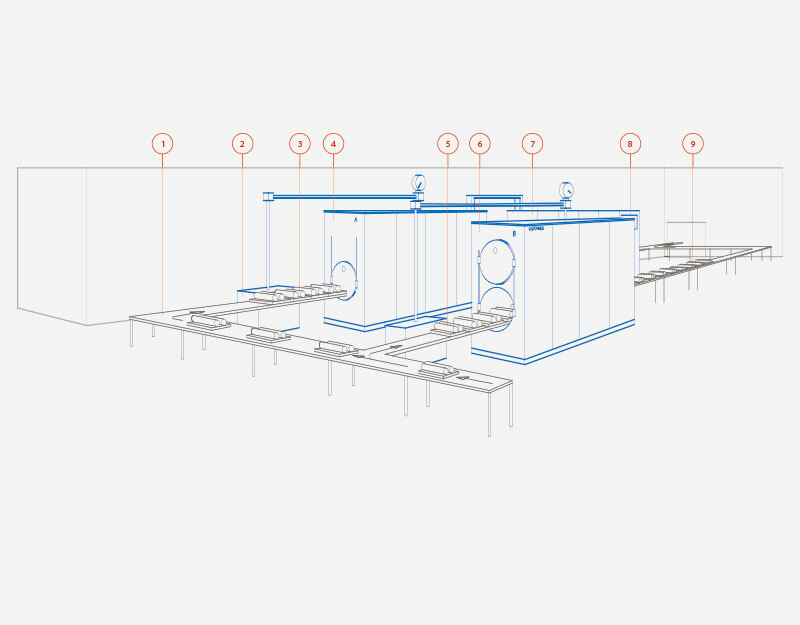 In order to find the optimal settings for a microwave production vacuum process, the trial plant shown in figure 1 can be used for process investigations. The microwave vacuum system can be equipped with different applicators and antenna systems. By using an infrared and fibre-optical temperature measurement system, core and surface temperatures can be measured. In addition weight loss, pressure and the absorbed microwave energy can be measured as well. 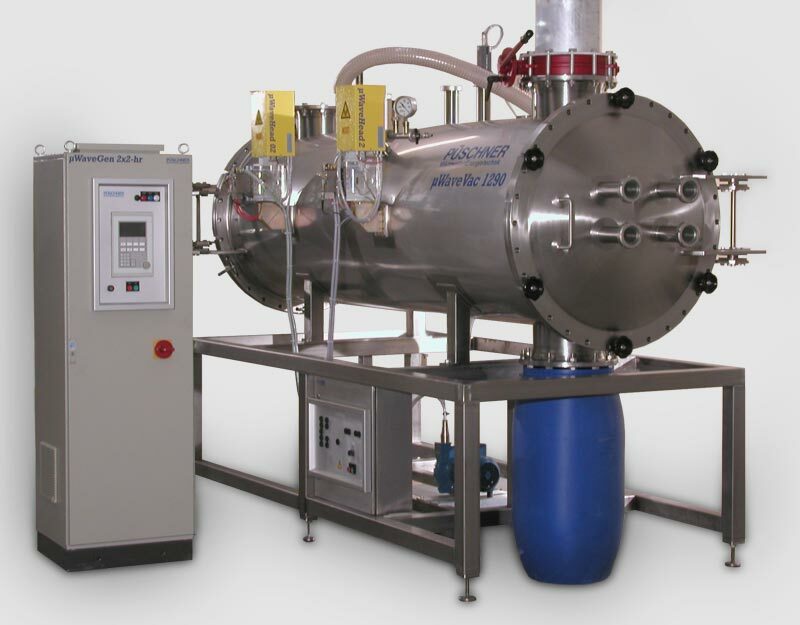 In order to perform trials for evaporation of solvents, the vacuum vessel can be inert using nitrogen. The procedure of applying nitrogen is observed with an oxygen measurement device. Based on the results of these trials, the final production throughput rate of an up-scale plant can be made. low temperature drying provides gentle treatment of the product due to low vacuum pressure. Evaporation of residual organic solvents, such as isopropanol etc. The microwave vacuum dryer µWaveVac0850 was designed and put into operation for gentle drying of thermo-sensitive products. The objective was to dry solid products, such as dialysers, in a continuous mode of operation. The dialysers consist of a plastic shell and internal fiber bundles. Moisture and organic solvent remnants originating from a previous processing step should be removed from the two ends of this product at temperatures below 65 °C, whilst any heating of the dialyser's mid-section is to be prevented. 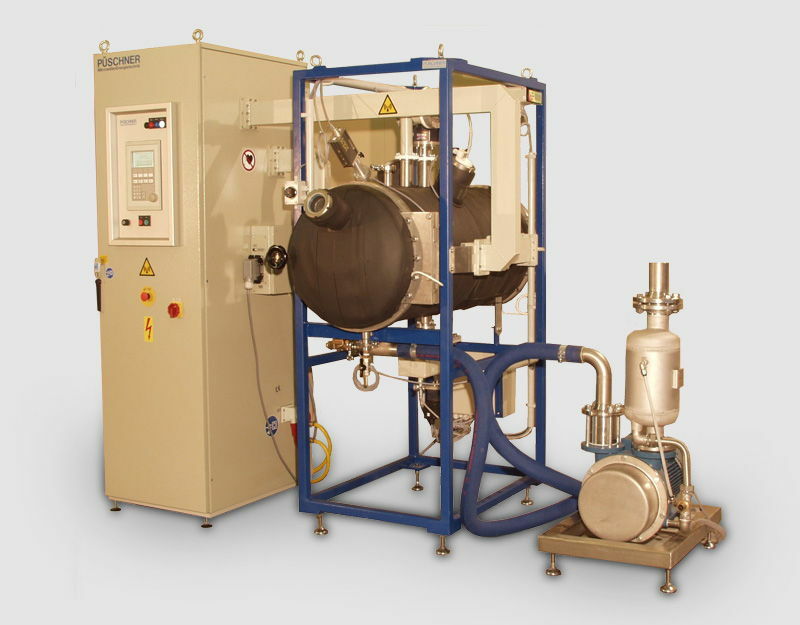 µWaveVac1290 for continuous drying of bulk materials, granulators, filter cakes, powders etc. 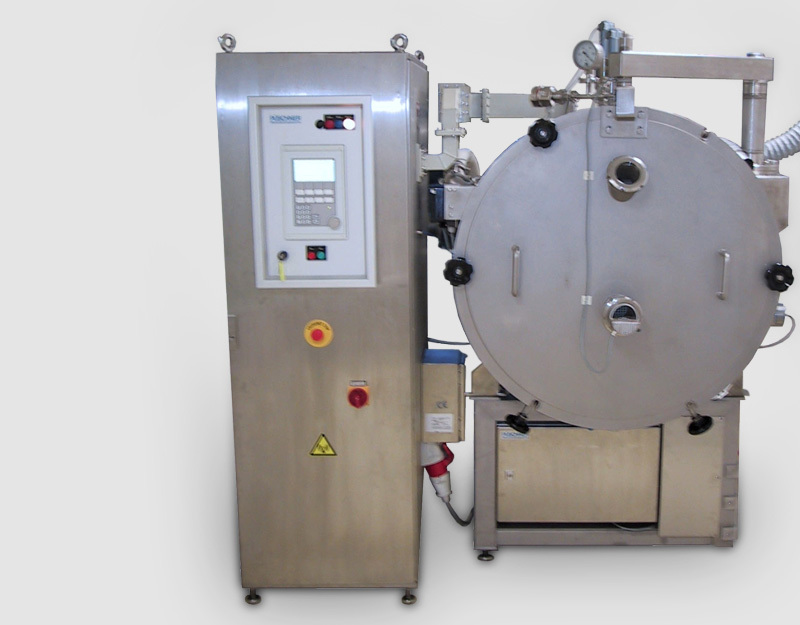 Microwave vacuum belt dryers are used for the continuous and automatic drying of temperature-sensitive products with low thermal conductivity such as herbal extracts, food, pharmaceutical and chemical products. The drying process is adapted to the desired dry product quality such as final solids content, solubility, density and others. Feeding of solids substances is effected by means of a suitably designed feeding device attached with a product orientated metering and distribution set-up in the dryer. When feeding wet products, a metering pump and an oscillating feeder are allocated. The movement of this feeder is adjustable during operation. Therefore, an easy optimising is possible. On two belt stages the products pass different microwave and conventional heating sections, where an appropriate drying profile can be applied to the product to achieve best results. low temperature drying provides gentle treatment for the product due to low vacuum pressure.